Save an extra 20% on our holiday sale prices. 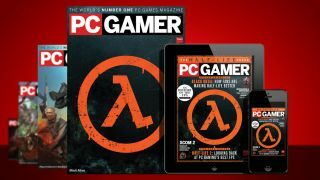 This weekend only, you can save an extra 20% on a PC Gamer subscription using the code NOV20 at checkout. This is on top of our already discounted Christmas price, which is up to 35% off depending on the package you pick. For a year's print subscription of 13 issues, for example, you can get it for £43.60, which works out at less than £3.50 an issue, according to our maths (UK residents only). Considering each issue hits newsstands for £5.99, that's a great saving. Every UK issue comes with an exclusive subscriber cover (like the lovely Half-Life special issue above), and free digital codes, which this year have included Total War: Warhammer DLC, Far Cry 3: Blood Dragon and exclusive beta access for Gwent. Subscribe now for this amazing price, and have a lovely shiny magazine sent to your door or tablet every month.